This Friday, like every other Friday, I'm linking up with April, Natasha, Darci, and Christina for their Five on Friday post. Here are the five things that are getting me through this last day of the work week. New Girl Season 2 is on Netflix! T and I just got into this show a few months ago when Season 1 became available for streaming on Netflix. I was bummed when I heard Season 3 would start airing this week. I didn't want to start watching it without seeing what happens in Season 2. So now we're recording all of Season 3 for later watching while we make our way through Season 2 as quickly as we can- I have a feeling that's not going to be too difficult. We're averaging 3 shows per night. I, along with the rest of the world, downloaded the new iOS 7.0 software on my iPhone this week. There are several changes in the look of the interface, but I'm digging it. I feel like I just go a new phone! I can't believe I didn't add this to my Five on Friday last week, but my new blog design is making me soo happy. It was long overdue to get something a little more crisp and streamlined looking, and I absolutely love it. One of my favorite parts about my new look is the logo. I had a coworker design it for me in his spare time- I guess that's one of the perks of working in the advertising industry! Tomorrow I'll go more in depth about the meaning behind it. Keep an eye out for that post, it's actually pretty interesting to learn all of the thought that went into the design. After almost exactly a year of going missing, I finally found my college ring yesterday morning! It had fallen back behind a shelf in my bathroom where I keep my towels. I guess that shows you how much I dust back there. For once, literally the first time in like two months, T and I have a weekend at home with no plans. I cannot wait to sleep in, go to yoga, lay by the pool, and do whatever else my little heart desires with no agenda to follow. Ahhhhhh. Don't forget to follow me on GFC and Bloglovin' y'all. I am soooo close to getting 100 followers on GFC, and I would love to make it there this weekend. Happy Friday! I was the same way with New Girl. Started watching it on Netflix and finished season 1. But, when I heard season 3 was premiering this week, I didn't want to watch w/o watching season 2. Thankfully, one of my Twitter friends told me season 2 just went on Netflix, so like you, I'm trying to catch up! Your weekend sounds heavenly --- enjoy... those are the best! And I'm going to have to watch New Girl! I keep hearing great things, but we cancelled Netflix. Might have to change that! Happy Friday!!! So jealous of your weekend, sounds so relaxing. New Girl is my absolute favorite show, I am constantly giggling through out every episode. Enjoy! 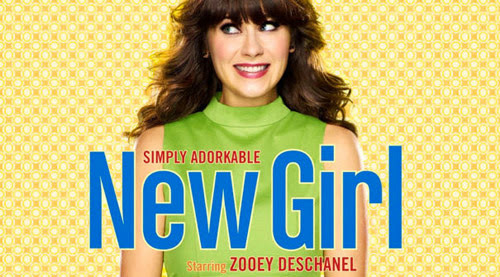 I don't watch a ton of tv b/c of school, but I keep hearing so much about New Girl. I think I may give it a try on Netflix. I love weekends w/ no agenda! tell me about this Five on Friday concept. I like lists. I like Friday. I want to know more.